There are all kinds of stair lifts available to fit different applications, from a straight half-flight to a seven-story spiral. While it’s important to select the right unit for your situation, it’s just as important to carefully select the company from which you buy that unit. Installing a stair lift might look simple to the untrained eye, but technicians who have been doing it for decades will tell you that it isn’t. A typical stair lift and track system have dozens of connections and adjustments that must be done exactly right to ensure safety in the long-term. With Area Access, you can rest assured that our installers care about safety and know their business. Area Access installs and services both straight and curved-rail stair lift solutions created by Bruno, a top manufacturer in this field for many years. See the videos below for information on Bruno’s popular straight and curved-rail Elite models. Stannah brings a distinctly European look and feel to stair lift technology, combining quality engineering with elegant style. Their line of stair lifts includes basic to luxury models to match your budget, and different upholstery and trim options to match the look of your home. In business for five generations and almost 150 years, Stannah has been making stair lifts since 1975. They have specialized products for straightand curved stairs, as well as an all-weather stair lift for outdoor applications. In addition, Stannah has created the one-of-a-kind “Sadler” design, a stair lift built for people with greatly reduced mobility. Stannah has become one of the premier brands relating to in – home accessibility by; setting gold safety standards, creating units that blur the lines between style and usability, and maximizing the reliability of their products so customers may go about their lives worry free. Area Access strives to place our premier lines in all of our customers’ homes in order to forever change the way they live. 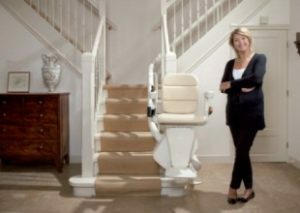 Sometimes the thought of climbing a staircase can be daunting, with a Stannah stair lift it never has to be. Customers with a lift in their home no longer worry about exerting that last bit of energy ascending the stairs. They can now save that energy for things that matter: Family time with the grandchildren, a night of fun with friends, or an afternoon sitting on the porch enjoying the spring weather as it rolls in. Today we brought in a member of Stannah’s safety team to go out with our technicians to verify our work and certify our team members to continue serving our patrons up and down the mid-Atlantic. We had a few minutes after his inspection to ask him a few questions about Stannah products and how they can improve the quality of life in any home. In the video you will see a one of Stannah’s premier products the Starla Curve. This particular model is special made for each staircase. Specific measurements are put into place to give the owner the maximum amount of space available on the staircase by bending tightly around even the tightest corners. Please watch our video to hear some of our most frequent questions getting answered by a Stannah expert. Call us today at 1-800-333-AREA to make your home accessible again. Designed by lifetime accessibility engineers with over 100 years of combined experience, Staying Home stair lifts epitomize the best in modern stair lift technology. There’s little not to like about this solid, fully-featured, and affordable brand. Rider capacity up to 350lbs. Unit folds to within 11″ of the wall, with narrow track to save space. Smart obstruction sensors for safety. Battery-operated mode completes up to 20 trips without power. High seat back and low-to-the-floor foot rest for superior comfort. Deluxe upholstered seat with retractable safety belt. As one of the least expensive and most prevalent stair lift lines, Acorn is already familiar to many customers. In addition to offering these economically-priced units for sale, we provide service for existing Acorn customers. Padded seat and backrest for comfort while riding. Light touch operation for those with limited dexterity. Safety belt standard on all models. Folding design saves room for normal usage of stairs. On/off switch can be locked for child safety. Five obstruction sensors halt operation for safety if stair lift path is blocked. Two remotes are included to accommodate multiple users. Handicare manufactures a selection of high-quality stair lift solutions for both straight, curved, and complex installations. Area Access is pleased to be able to offer this fine import line for our customers. Joystick control on left or right arm. Folding arm and foot rests. Come visit our well-stocked showroom in Manssas or Norfolk, Virginia. We usually have at least five or six working demo stair lifts available at any time, and expert salespeople to fully address any questions or concerns you might have. As customers trade up, used stair lift units become available on a regular basis. We generally have several pre-owned models in stock. Naturally, selection varies, so call or drop by our showroom for more information. The Pinnacle stair lift is well known as an outstanding solution for straight-rail residential needs. The unit is visually attractive and more compact than most stair lifts, folding just 11 inches from the wall when not in use. Its track consumes a modest 7.5 inches of stair width throughout. Despite this small size, the Pinnacle has a large and comfortable seat which also swivels for safe entry and exit. The economical Minivator Simplicity saves on the initial outlay without compromising safety. The joystick, designed with input from occupational therapists, makes the stairlift easy to use, even for users with joint problems. The seat is finished in wipe-clean sand-colored upholstery. Hinged track or sliding track if required. Automatic footplate available as optional extra. Maximum load 300 lbs. Sliding track model has a maximum load of 260 lbs.